Get rid of steam and cooking smells. Cooking steam can really add to household condensation and moisture build-up. Removing moisture from where it’s produced is the best way of dealing with the problem. Which models will do the job? Snapshot: The Bellini BRA603GCX-1F 60cm Curve Glass Rangehood - Ducted is a wall canopy rangehood with front-panel controls. But how well does it remove steam and cooking smells? Snapshot: The Bellini BRA603GCX-1F 60cm Curve Glass Rangehood - Recirculating is a wall canopy rangehood with front-panel controls. But how well does it remove steam and cooking smells? Snapshot: The Bellini Designer Black Fascia BDR603TBX is a canopy rangehood with front-panel controls. How well does it remove steam? Snapshot: The Asko CC4927S is an undermount rangehood with controls underneath the hood. But how well does it remove steam and cooking smells? Snapshot: The Neff D55MH56N0B - Ducted is a undermount rangehood with inconvenient controls underneath hood. But how well does it remove steam and cooking smells? Snapshot: The Neff D55MH56N0B - Recirculating is a undermount rangehood with inconvenient controls underneath hood. But how well does it remove steam and cooking smells? Snapshot: The Miele DA2360 is an undermount rangehood with controls underneath the hood. But how well does it remove steam and cooking smells? Snapshot: The Miele DA 3466 - Ducted is a retracting rangehood with front-panel controls. But how well does it remove steam and cooking smells? We’re reporting on 60cm and 90cm wall canopy models, undermount or integrated models, and retracting or slide-out rangehoods. All were tested in the same lab using the same test method – so the results can be compared across all models. To make things fair, the 60cm models were tested over a 60cm cooktop and the 90cm models over a 90cm cooktop. On average, the wider 90cm rangehoods were more effective than the 60cm hoods. 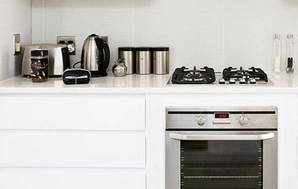 If you have the space, think about installing a 90cm model – even if your stovetop is the narrower 60cm width. We tested all the rangehoods so they ducted outside, and if applicable in recirculating mode. In ducted mode, the steam (which can be greasy from frying) and smells are blown outside. In recirculating mode, air is passed through carbon or charcoal filters and recirculated back into the kitchen. This eliminates cooking odours and grease, but not moisture – which goes back into your kitchen. Installing in recirculating mode is a second-best option. In each mode we tested how well they removed steam from the room – first with 2 saucepans of simmering water and then with 4. We tested their performance with the fan on high and on low. We also measured noise levels with the fan on high and on low. Next we checked how easy it was to get at and clean the mesh filter, replace a carbon or charcoal filter (only applicable for recirculating mode), use the controls and clean the exterior surfaces. Finally, we assessed how well each rangehood lit the stovetop. Our testing shows ducted rangehoods perform better and we only recommend rangehoods that meet our criteria in ducted mode. Always install them to be ducted if you can. When you install a rangehood, it can be installed in ducted or recirculating mode. In our product database, each model is listed by the mode it was tested in. This means most models have 2 sets of test results because they can be used in both modes. In ducted mode the steam (which can be greasy from frying) and smells are blown outside. It is now illegal to duct into the ceiling cavity, because the build-up of grease can be a fire hazard and moisture can cause condensation and rot. In recirculating mode, air is passed through a carbon or charcoal filter and recirculated back into the kitchen. This eliminates cooking odours and grease, but not moisture, which goes back into your kitchen, so it’s a second-best option. Installing in recirculating mode is cheaper as no ducting is required, but you may need to buy a recirculating kit. You’ll also need to replace the carbon or charcoal filters – how often depends on how much and the type of cooking you do. Cooking that produces mainly steam means your filter will last longer than it will with high-fat cooking that produces strong smells. Manufacturers recommend replacing the filter every three to six months. Rangehoods perform better in ducted mode, but for some people ducting won’t be an option (you live in an apartment or installation in ducted mode is too expensive). Tip: When installing a rangehood it’s best to use rigid ducting. Flexible ducting has ridges which can trap air and impede performance. If you’re thinking about buying a rangehood, here’s what you should consider. Size: With 2 pots on your cooktop, most hoods will cope pretty well, and won't let steam escape at the sides. However, most models won't cope very well with 4 pots of simmering water, particularly if they're only 600mm wide. Fixed hoods often fail to cover the front hobs. The bigger the rangehood, the more effective it will be at removing steam and odours. If you have the space, consider fitting a 900mm-wide range hood over a 600mm cooktop. The extra width on each side will catch more steam. Hood shape: Ideally the hood should extend over the hobs, so that all escaping steam is captured when the hobs are in use. Filters: All rangehoods have a filter to trap oil and grease. Reusable metal filters can usually be put in the dishwasher. The carbon filters for recirculating mode need to be replaced regularly and are an ongoing cost – check that they’re readily available, too. Fans: Efficiency is not necessarily related to the number of fans. Some single-fan models can out-perform two-fan models. Noise: Fans can be quite noisy on full speed, and there's a tendency for noise to increase with performance. A range of fan speeds is therefore useful: you don't need the thing whooshing away if you're just scrambling some eggs. Noise levels can get up to 60 or even 69 decibels (dBA). Lighting: For visibility over the cooking area, two bulbs are better than one. Check that the bulbs are easy to replace – some aren’t. Exterior: The rangehood should be easy to clean and have no nooks or crevices where dirt and grease can build up. Fixed rangehoods with a smooth underside are generally easier to clean than retractable ones. Maintenance: Rangehoods are not maintenance-free. You need to remove and wash the filter, clean the body of the hood and occasionally change a light bulb. You should be able to perform most of these tasks easily – if there's a problem, contact your distributor. Controls: It's pretty standard for hoods to have their controls in an easy-access position on the front. However, some models have sliding switches that are a little tricky to set in the right position. Touch controls are easier to use. There are 5 types of rangehood available: fixed, tilting, sliding, canopy and undermount. All usually come in 60cm and 90cm widths. Shaped like a flat box, they're fixed permanently to the wall or under an overhead cupboard. Some have a small hinged visor. They can be fitted to a new or existing kitchen. DIYers should find these easy to install. This type of hood works well with a couple of pots steaming away, but it will miss quite a bit of the steam if you have all 4 elements going. Because they always stick out they can get in your way. These are mounted between cupboards and have a front panel that tilts open. The panel can be matched to your kitchen décor. To use the hood, you swing the front panel out over the cooktop. Tilt hoods are more effective than fixed ones at removing large quantities of steam. So if you often cook with all 4 elements at once, a good tilt hood may be a better option. Controls on tilt models are usually somewhere behind the tilting front, and are a little harder to use than the front controls of fixed or canopy models. Tilt hoods are usually considered for new rather than existing kitchens, because of their "built-in" nature. But if you're getting new cupboards done, or don't mind having to reconfigure your existing cupboards, they are worth considering. These are designed for kitchens where you want the hood to be out of the way when it's not in use. They're generally mounted under cupboards and have an extension that slides out – the fan and light come on automatically. They are generally less efficient at collecting steam because of their smaller steam collection area. Canopy hoods are large and comparatively expensive. Once confined to commercial kitchens, they have joined a range of other high-quality cooking equipment that has found its way into domestic kitchens. While other types are usually ducted through the wall, most canopy hoods have a vertical flue that takes cooking fumes out through the ceiling or wall. The hood itself is usually made of stainless steel or glass, and can be deep and rectangular, or curved. Some are fixed to the wall, others hang from the ceiling. All the canopy rangehoods in our test are wall-mounted models. With a more powerful fan, bigger chimney and greater width, canopy hoods often have a higher airflow than fixed types. They usually have additional features such as electronic controls, built-in halogen lighting, glass shelves, a rail for hanging implements, and 3 or 4 fan speeds. Also know as "powerpacks" an undermount rangehood is hidden away above your cooktop, which makes them an unobtrusive choice. However, because they don't necessarily cover the entire cooking area they may not work as well as a canopy rangehood, depending where your saucepan is located. We asked our members about their rangehoods to find out which brand is most reliable.